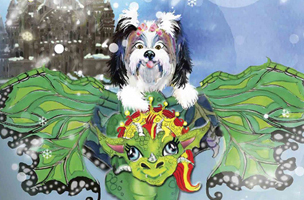 In this third volume of the Tinky’s Adventure series, Tinky, a small Shih-Tzu is literally sucked into a fantasy adventure in a faraway land. A big truck, a suitcase, a snow globe, a castle, and a big, green dragon princess move this charming fantasy full circle with surprises. Sweet loveable characters, fun language, silly situations, plus enchanting illustrations engage your child to use their imagination and have a giggle or two. Tinky and the Dragon is a picture book that your young child will cherish and want to read over and over again. And you will be happy to join them. Other volumes in Tinky’s Adventures include: Tinky’s Magic Cookies and Tinky and the Baby Butterflies. Tinky and the Dragon (Tinky’s Adventures), is available as a free download from Amazon 05/29/2014 – 05/31/2014. As of this writing, the book has an average of 4.3 out of 5 stars from 7 customer reviews. For more free eBooks, check out our 10 Websites to Download Free eBooks list, as well as our Free eBook of the Day archive, previously, on Appnewser.